Big part of why I am such a fan of boost drivers is this right here. 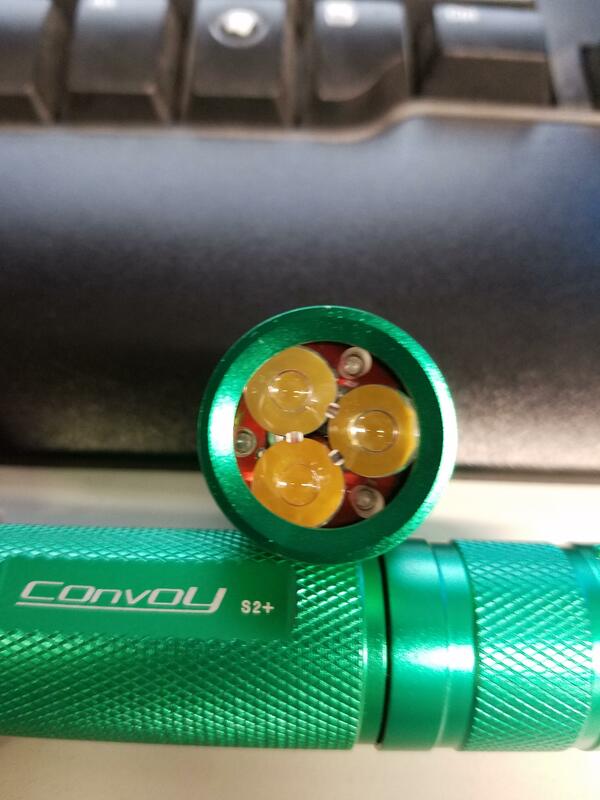 This is my latest S2+ triple, running in series with an H1-A Boost driver. Because it is in series the current is the same in all emitters regardless of the Vf. This allows us to freely mix emitters. Interesting. I thought the H1-A didn’t output high enough voltage for three 3V emitters in series. I should get one too then. Output Voltage: 6V – 6.8V max. It doesn’t as they come straight from KD, but if you change the 47k FB resistor to a 75k, it does it without issue. Been running a few 3S triples this way for a couple of months now with no problems. Still very efficient too. Did you also changed other resistors to get more Amps? I changed the R025 to an R030 to reduce the current, since all 3 emitters see the full current. What is the effective diameter of the lens? ThorFire TA13 lens measured at ∅31.5mm outer, ∅26.5mm effective inner, 8.1mm thickness. Pocket friendly. Its o-ring is also of 31.5mm outer diameter, 1.5mm thickness. Water tightness seems good for a zoomie. Originally posted on Fri, 09/15/2017 - 18:40. Edited for a lens measurement data fix. Peeked more in-depth in the TLF SF30A review & modding thread khas linked. My modded TA13s should be achieving ≈50Klux fully focused, considering ≈20W reach their XHP35 HI C2 30Gs. Interesting the inner cylinder extension (≈5mm) mod proposal, I wonder who would be willing to craft such a piece for a reasonable cost (preferably in copper). It is a bit @#$% to see how the torch designers didn't realized this beforehand. Original post date: Fri, 09/15/2017 - 22:22. Edited for a lil fix. 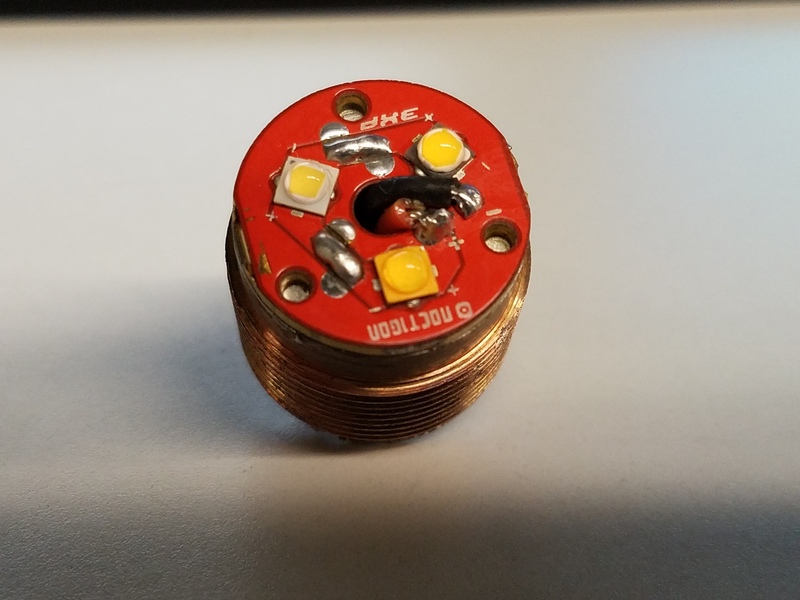 Doesn’t it emit some IR (or near-IR) as a a part of the light output? I have felt an IR heat out of the front of lights on medium power, where the Noctigon and host are fairly cool. The thermometer is an old high end unit, not sure if its user manual is buried in my user manuals' drawer but I am pretty sure it measures way beyond 125°C, I could measure 210°C in my smoky electric frier just last night. It even has a laser for aiming. 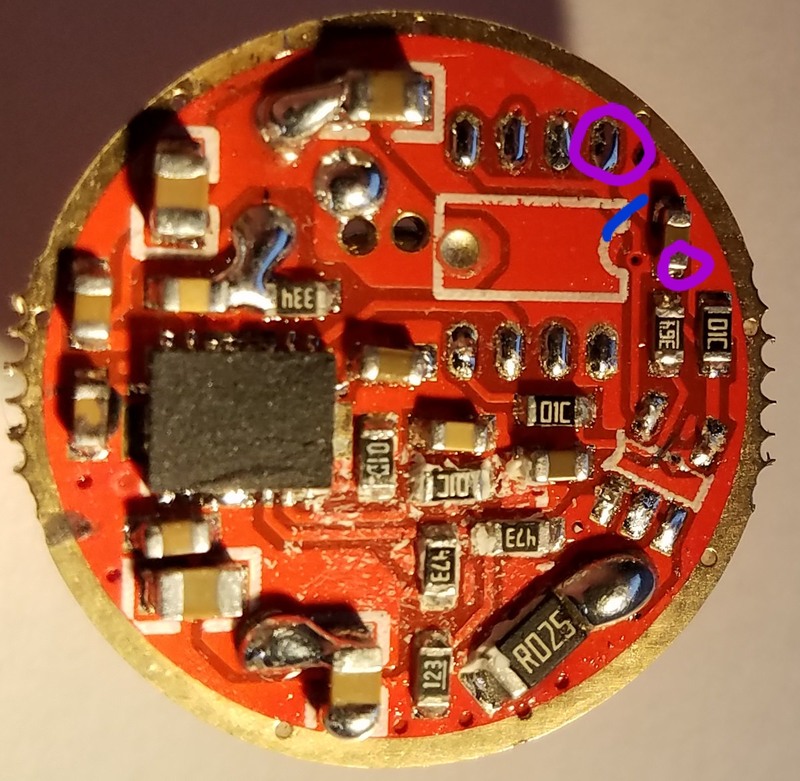 So far as I know, the best way to measure LED temp accurately is to put a thermocouple/thermistor based thermometer probe on the central solder pad of the LED (some MCPCBs eg Noctigon even have some exposed pad for this purpose), measure the temperature, measure the power going to the LED, calculate the temperature drop across the junction-to-pad substrate using the resistance given in the datasheet for that LED, then add that drop to your measured value, and finally you would know the junction temperature for that power level. I have what is probably a simple question, it seems that by my reading of the TI datasheet, that this should be ok. I have a Mag 4D that runs with Ni-MH batteries, when fully charged read around 1.4v each. 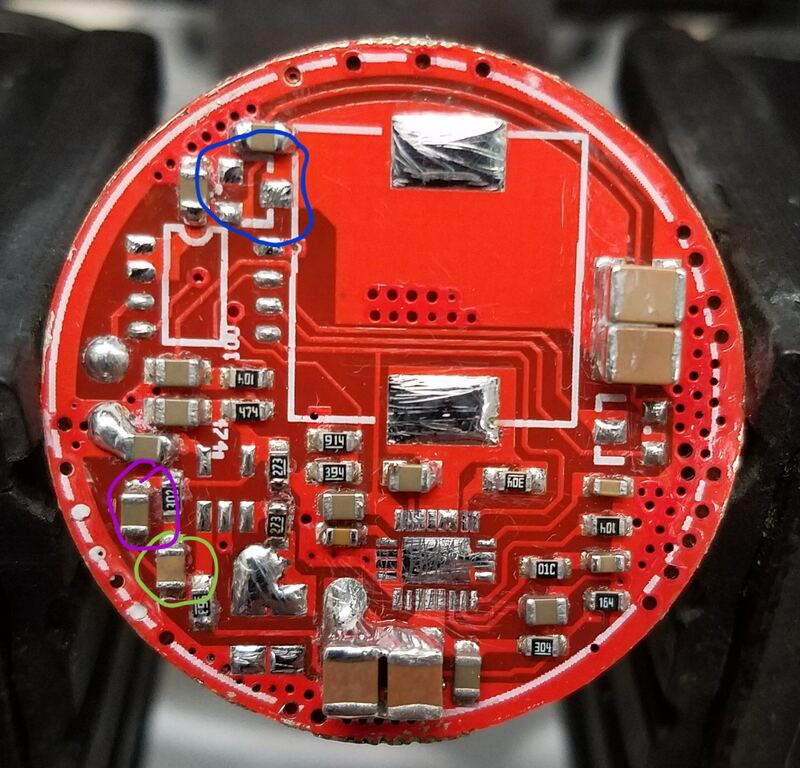 I know most of you are running off 1 Li-ion cell, so would never see a 5.6v into the driver, but it seems like it would be safe to do this, and run an XHP70 at 6V. Any ideas? With a freshly charged 4S bigass NiMH set the input voltage may result a bit high for the low mode to be regulated on the H1-A, wildstar87, but it should work. The low voltage cutoff is at 3V, this would result to an average of 0.75V/cell. Not bad. H1-A would be fine with a 4S Ni-MH input, but as barkuti said the low mode may not be well regulated (it will likely be brighter than expected). Nothing will be hurt though. Barkuti, the LTC3780 modules are quite nice, I have 2 of them I use as an LFP charger for retrofit Ni-Cd drill packs. Not positive how they would work for your cordless area light as I don’t think I have tried that specific combination of input/output, but I imagine it should handle 1S input at 10A no problem. So I can now confirm that H2-C can be modded to change the output voltage and LVP value. LVP mod could also work for H1-A and KX70. More details in my scratch build thread, I will probably repost here later. Thanks for sharing your findings! Updated OP with test results from an H2-C configured as I used in my scratch build. This driver is a champ! Efficiency on the modes that matter is basically 90+ up until the very bottom of the discharge. Regulation is also maintained right up to the end of discharge. Numbers for turbo mode are slightly dubious, as my electronic load showed a voltage higher than I saw from the meter measuring at the board, and the load number was bouncing around while the meter number was solid. The rest of the modes both had solid voltage with the load showing lower than at the board as expected, so those I trust completely. This is to attract knowledgeable folks on this matter: Serial battery charging with in series TP4056 modules? I managed to greatly improve the KX70 driver this morning. It now has constant regulation through the entire discharge as well as actual mode spacing. To get the driver to regulate through the entire discharge all I did was place an SOT-23 2.8V LDO in the blue circle. Stock this is just bypassed with a 0-ohm jumper link. I used the KD “528” LDO that I took off of an FX-35 driver, but almost any 2.5V to 2.8V output LDO in SOT-23 package will work here as long as it supports high enough input voltage. To get mode spacing back I removed the capacitor and resistor in the purple circle, and replaced that capacitor wirh the capacitor in the green circle. Another option would be to just remove the purple circle capacitor and then bypass the resistor with wire or a solder bridge. End result is the same either way. I will re-run the output tests later to show the improvement in mode spacing. Also updated the OP, but here is the KX70 test results with the LDO and Filter cap mods. Fantastic driver now, no complaints at all. I plan to duplicate this setup on the driver in my JKK36 host which should make that light much more useable. The KX70 seems great with these mods The only drawback is the diameter. Can the H1-A be modded in a similar fashion? H1-A doesn’t need the same mods, it already has decent mode spacing stock, these mods actually just change the KX70 op-amp setup to match the H1-A/H2-C. Efficiency of the H1-A will never really match the KX70 just because of the physically larger components and copper layers for heat dissipation. Voltage mods, current mods, and LVP mods can all be done to H1-A. If we get custom firmware for the MCU a momentary switch can be done with H1-A also. Or it can be modded to use a normally closed momentary switch as it is. I purchased some NC momentary switches for this purpose. Can you mark up a quick diagram that shows where to put it? Sure. Surprisingly this is the best photo of H1-A stripped down I have, this is the driver without the inductor and MCU. You don’t have to remove the inductor and MCU to do the mod, but it will be easier if you do. You’ll need to cut a trace on the PCB where I drew the blue line (top right) and then connect your switch with small wires between the two purple circles. When the switch is pressed you are just quickly cutting power to the MCU as if a clicky were half-pressed. Keep in mind since it is on-time last mode memory, if you have been on one mode for awhile it will need a double click to switch modes the first time. The KX70, does it need a momentary to change modes, or is that only needed if you want the “hidden modes”? It seems that the H1-A is just the standard on-off switch to switch modes, the extra button the KX70 is confusing me what it’s functionality is. I don’t really want to have to use a momentary if I use the KX70. KX70 is momentary switch only. It will not turn on with only a clicky on-off type switch. If you want clicky the H1-A is the way to go. I’m assuming it’s just a firmware issue though? Could I swap the microcontroller from the the H1-A to the KX70? Pinout is slightly different. Not sure what MCU the KX70 uses, the chip is blank on the top. Schematic is posted earlier in this thread so if you can locate a compatible MCU it is just a firmware issue. I’m trying to understand these drivers, I don’t quite understand what the Opamp is doing in this?